Description: Northbound Southern 116 heads into Nemo Tunnel with 2 SD35`s and a SD40-2 for power. Description: NHSE-X whips up some of that freshly fallen snow exiting the west portal of tunnel 1. 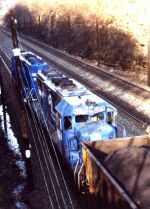 Description: Conrail, CNW, and UP participated in a run through train from Elkhart Ind to North Platte on the UP, symbolled ELNP. To get through Chicago, it used the Indiana Harbor Belt to get over the gap from CR to CNW. Here it is with all three component roads power having just rolled under the BN. This type of consist was typical. Description: A manifest rolls east.